Adult Literacy – what do they really need to know? It’s estimated that 70% of Sierra Leone’s population lives at the impoverished level of $2 USD/day or less. This is sometimes globally called the bottom billion, the lowest tier on the ladder of the world’s seven billion population. This is true of rural Bumpeh Chiefdom. As you move into more remote villages, the percent no doubt climbs above 70% to most if not all of these communities. With this kind of poverty comes lack of education. If you want to provide adult literacy education, where do you start? Literally, where should you begin in this kind of environment? A good place is to know the group you aim to educate. This is where Rotifunk’s Center for Empowerment and Transformation, a local all-volunteer group of Rotifunk teachers is beginning their work on adult literacy. Shortly after Prosperity Girls High School Principal, Rosaline Kaimbay came to Rotifunk to begin her work on the school, adults expressed their interest in learning to read and write. Others had attended school, but had to drop out and wanted to continue and develop skills to join the job market. Or to help their own children as they progress through school. The Center for Community Empowerment and Transformation has made adult literacy for these people a cornerstone of the Center’s work. I asked about a profile of the current adult learners. All are now women; hopefully the men will follow. The majority of the women are single heads of household, divorced, separated or widowed. They are mainly in their mid-30’s, but range from 20 years old and up. This is the group that would have had their schools abruptly shut or interrupted during Sierra Leone’s civil war when towns and villages were abandoned to rebel fighting. In the early years of rebuilding following the war, schooling would have either not yet been available, or the cost beyond the reach of rural families. Girls’ education would traditionally have been given low priority, especially as a girl approached marriageable age. Women fetching water for their vegetable garden. Early primary school learning for these women has long been lost and forgotten. They moved on with their lives in the footsteps of their mothers and grandmothers, doing the work available in a subsistence agriculture community. They became small traders and small farmers. 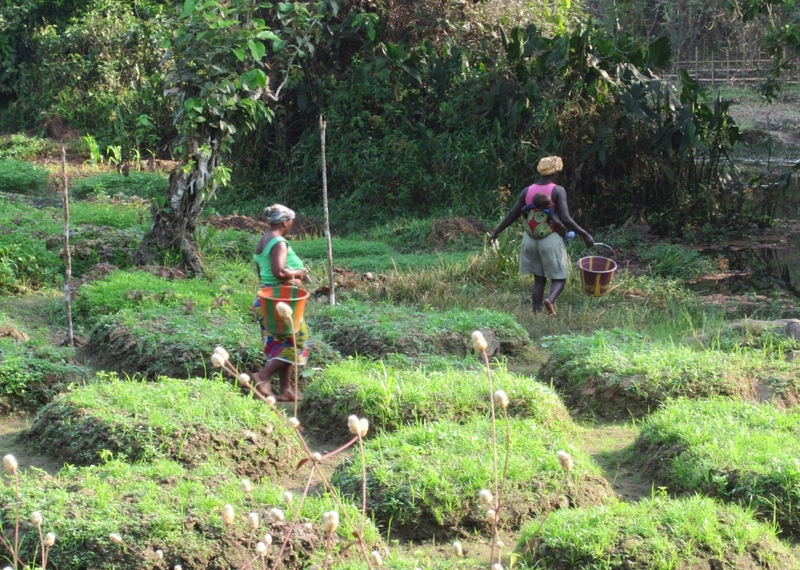 In one way or another, 70% of Sierra Leone’s population is involved in agriculture. Either they grow things themselves, or they are small traders who buy agricultural products like rice, palm oil and vegetables in quantity from small farms and bring them to resell in larger village and town markets. Small traders may also buy “general store” items in larger towns to resell in local markets – cooking utensils, plastic buckets and basins, soap, batteries, plastic sandals, cloth and so on. These are working women, working in what’s called the informal economy. It’s the economy of small farmers whose schedules are driven by the planting and harvesting seasons, and of small traders who must be available for market days in towns and villages where they sell their wares. They need knowledge that will help them improve their current lives, and on a flexible schedule. Small trader selling smoked fish in Rotifunk’s market. Traditional reading and writing is not the first priority for these women. The typical classroom reading, grammar and writing kind of stuff that you get over twelve years of public education is not of immediate use to them. Basic arithmetic is a priority. Vocational skills tailored to their kind of work are another need. The volunteer teachers at the Center for Community Empowerment and Transformation are embarking on a “functional adult literacy” program. They will teach their adult learners what they need to know to successfully conduct their business and improve their lives. Traders need to know basic computations to ensure they’re getting the best price for their goods, how to calculate interest for the small loans they invariably take (or maybe give to friends), and skills on how to better market the goods they sell. Small farmers need to know about applying fertilizer and manure, when and how much, and how to “add value” to their agricultural products by further processing or packaging to get a better price. They would all like to know more about female reproductive health and social skills to better manage conflicts (known here as palavers), useful when you’re living in the confines of a small village. And they’re enjoying recreation organized specifically for them – women’s football (soccer) teams. Where else would a village mother find the time (or give herself the permission) to play sports and release the pent up stress of living in poverty and develop the camaraderie of a group of peer women. There’s no curriculum for this kind of functional learning, so the Center’s volunteer teachers will develop their own lessons. Experienced teachers know how to do this, and build as they go. They understand these things when they lived embedded in the community with their students, and are committed to working with them. Now, how to give these women the time from their busy lives to take advantage and improve themselves? Sound familiar? I have no doubt this program will grow and the merits be known by word of mouth from the initial group of students. Success breeds more success. Have yyou ever considered about adding a little bit more than just your articles? Thanks, Karissa. Come for info, yes. Gossip, never. But yeah, thanx for spending the time to talk about this topic here on your web page. Candida, glad it helped you. Why not help Sherbro Foundation and the people of Sierra Leone with a little donation. It must have been worth the price of your dinner?! See the Donate button on any post. My brotheг reϲommended I may like thiѕ web site. He was once totally right. Hi there, after reading this awesome paragraph i am too glad to share my know-how here with colleagues. Thanks for commenting, Winston. Appreciate it. Thanks for commenting, Katrin. And forwarding. Apreciate it. for revisiting. I wonder how a lot effort you set to create one of these wonderful informative web site. Virgilio, thanks for commenting. Glad you feel you learned something here. It’s my objective to educate and inform on life in rural Sierra Leone. Thanks for your feedback. Blaine, glad you enjoyed the post. Thanks for commenting. Russel, Glad you agree with the message in this post. You can read abt the Adult Literacy program in a post this week – “The Extra Gift Adult Lit Brings.” Please return and read more abt Sherbro Foundation’s work in Bumpeh Chiefdom. Thanks! Marcela, Thanks a lot. By all means, please Forward The Sherbro Foundation website to your friends. That’s a great to help us get the word out about our projects in Sierra Leone. I hope read the post I just wrote on the Adult Literacy project and forward that to your friends. It’s an important one that has a big impact for so little cost. Thanks for your interest and support. I’m impressed by the details that you’ve on this website. and simply couldn’t come across. What a great website. Alta, thanks. That’s a great compliment. I need to thank my Sierra Leone friends who let me be part of their work and their lives. That’s what allows the blog to be authentic. But, what about the conclusion? Are you positive about the source? Appreciate your comment. Thanks. When you ask am I positive about the source, everything I write about comes from my own trips and experience in Sierra Leone. So, yes, it’s the real thing. I’ve been very happy with WordPress. This is the Skylark template. It’s a website format, not just a blog. The blog is one page of the website. If you go to Home, you’ll see you get several Tabs at the top, one of which is for a blog. I am a nonprofit organization, so I have a lot more provide than just a blog. WordPress doesn’t really distinguish between a simple one page blog format or websites. They’re all together among their list of templates. They often call all of them “blogs” generically, because I guess that’s how they started. Good luck. Hi. I haven’t had others comments about this and haven’t had the problem myself. I just normally use Explorer. Today I’m on another PC using Safari and it’s fine. Hope you continue to visit the blog. I am truly glad to read this blog posts which consists of tons of useful information, thanks for providing these kinds of data. Ths sounds amazing! I would love to find out ways I can help with this centre, would you know where or how I can find out more information regarding this? Thanks so much for your comments on the Sherbro Foundation and our work with the Center for Community Empowerment and Transformation. I am very proud of what this volunteer group is doing to develop their rural Sierra Leone community. If you are interested in donating, there is a Donate button on http://www.sherbrofoundation.org. It’s in the right hand column of each page after the Home page, and each post in the Blog and any of the other pages. We recognize not everyone can donate financially. 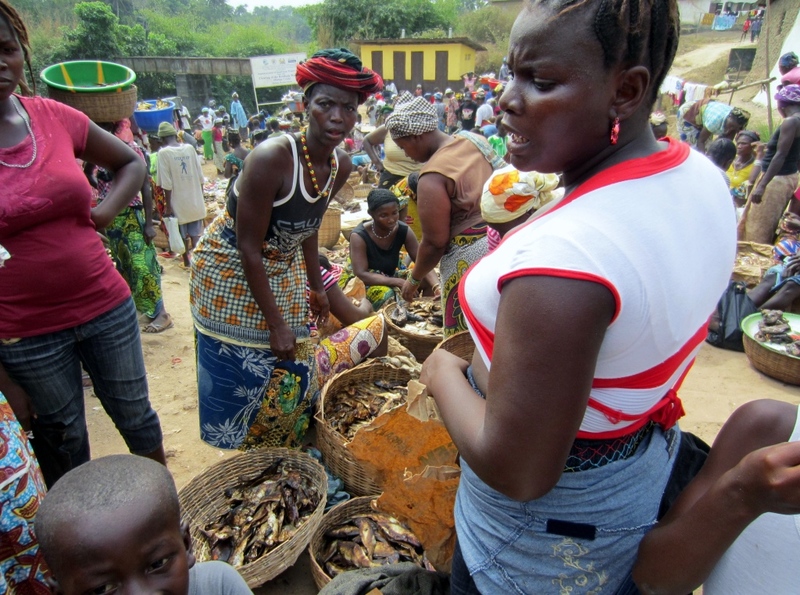 There’s other things people can do to support our work in Sierra Leone. Please see the How You Can Help article on the bottom of the http://www.sherbrofoundation.org Homepage, and repeated under the What We Do page. Things as simple as forwarding a blog post to your own Facebook page with a personal message or in other ways informing your friends and family is a great help.